I've had this white cake mix in my cupboard for a couple of months, just waiting to be made into some mini cake mix scones. I finally had the opportunity to make them the other morning when my school had a delayed start due to cold weather (yeah, it was maybe two degrees warmer after the two hours...). 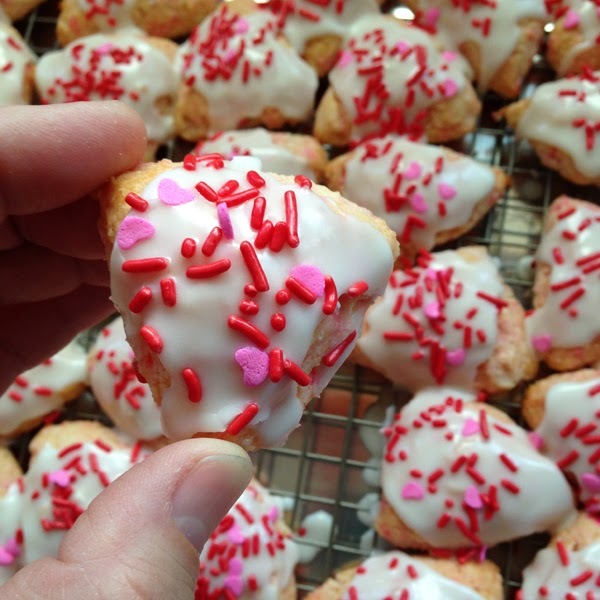 At any rate, I wanted to make these on a day I could take them to work or somehow share them because it makes a LOT of mini scones. Forty-eight to be exact. I did eat two of these, and that was plenty. I love them, but maybe too much. Better to have them out of the house. What I like about these is that they have all of the flavor of a yummy white cupcake, but without the sweetness. Their texture is that of a tender scone; and the butter and cream just make them all that much better. The sprinkles just make them look super cute. The scones were gobbled up well before lunchtime at my school, and it made my teacher friends very happy. 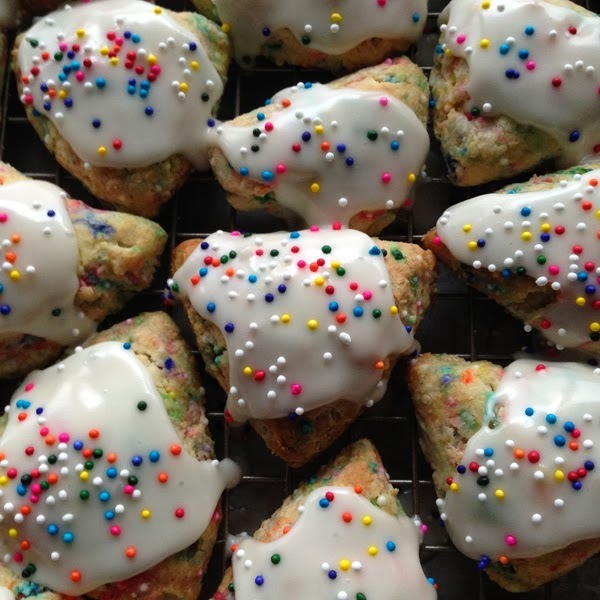 Oh, and I do have the recipe for the full size Cake Mix Scones on this blog too. It's really the same as the recipe here except for cutting the 12 scones into fourths. I could have just put a picture with the modification on that post, but I really wanted to feature these cuties all on their own. Preheat oven to 400 degrees Fahrenheit. Line two baking sheets with parchment paper and set aside. Place cake mix and flour in a large bowl. Add cold butter chunks and cut in with a pastry blender or two knives, until mixture looks like coarse meal. Stir in 1/4 cup nonpareils. On a work surface, sprinkle some flour and get large knife ready to cut scone dough. Lightly beat the heavy cream with the 2 eggs in a small bowl. Pour liquid into dry ingredients and mix quickly with a silicone/rubber spatula until almost completely combined. Before the nonpareils bleed too much, turn dough out onto the floured work surface. Knead dough lightly so it holds together (your fingers will get quite gooey). Cut dough in half and one at a time, form each half into a disk about 3/4-inch thick. With your large knife, cut into 6 equal wedges. Cut each of those wedges into four triangles by cutting a little triangle out of the tip and then three from the remaining long piece. 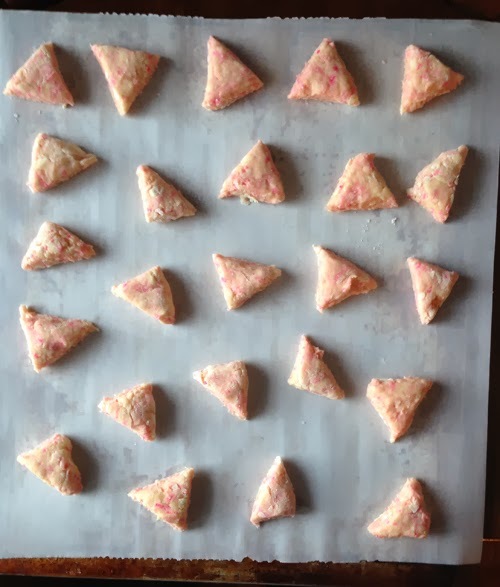 Place wedges on parchment lined baking sheet. Repeat with the remaining dough. Move wedges around so they are evenly placed. Bake at 400 degrees for 8-9 minutes, or until they start to brown on the bottom. Remove from oven and move scones to a cooling rack to cool. 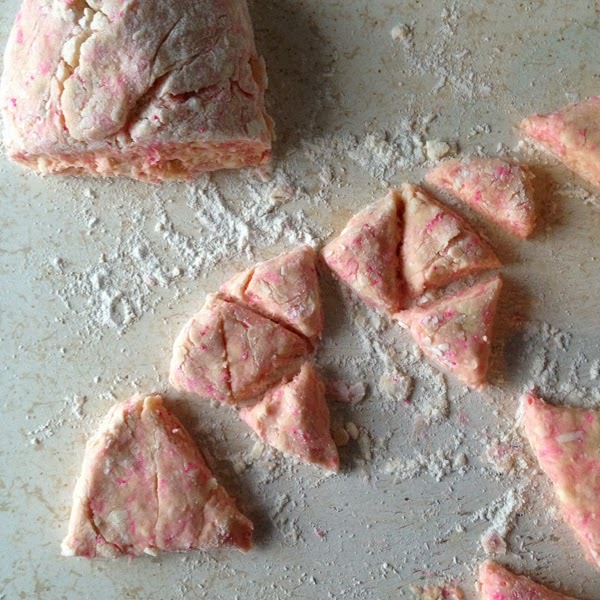 Allow scones to cool almost completely before attempting to glaze. Prepare glaze in a medium bowl by whisking together the powdered sugar, vanilla, and half & half/milk. 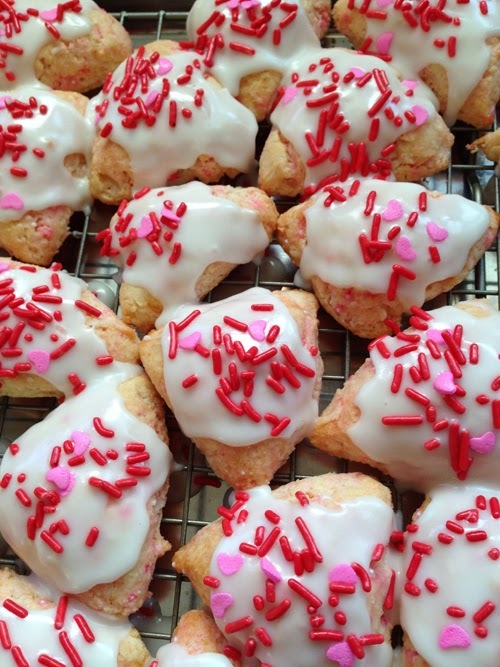 Drizzle glaze over scones and then sprinkle with nonpareils, if desired. Hopefully you get the idea of how to cut them somewhat evenly.